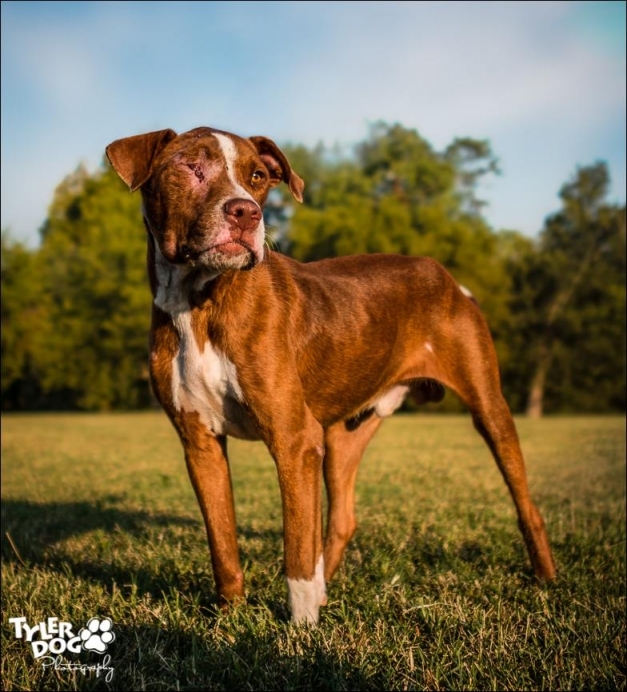 Romeo, an injured Pit Bull at the City of Tulsa Animal Welfare, 3031 N. Erie in Tulsa, OK., 918-596-8011. You see, her love, Romeo, was a Montague. And Montague was a despised name in the Capulet household. Much like the name Pit Bull is despised by many. It seems each week we hear horrific stories of Pit Bulls tortured, fought, or shot: Puppy Doe, the young Pit Bull tortured beyond belief in Boston; 367 Pit Bulls Rescued from Dogfighting Bust; Neighbors say police shot dog for no reason. Headlines scream. Investigations continue. All the while more dogs die. Because of a name: Pit Bull. Somehow people seem to think because it’s a Pit Bull, it’s okay to do those things. I mean, Pit Bulls, they’re crazy monsters, right? They attack for no reason! They’ll eat your babies if you turn your back! Their jaws lock, for God’s sake! It all must be true because that’s what Pit Bull haters spew forth on a daily basis. Right?! So not right. Which brings me to another young boy named Romeo. This fella was brought to the City of Tulsa Animal Welfare by a woman from Sapulpa who tried to surrender him. When told she must turn him into the Sapulpa shelter since that’s where she’s from, instead of doing the right thing she drove down the road, opened her door and threw him out. Jean, the director of TAW, just happened to drive down the same road a few minutes later and saw him. She couldn’t get him into the car, but he did follow her all the way back to the shelter. Jean said his face at that time was grossly swollen and he just looked defeated. Why is yet another Pit Bull bloodied and battered? Why would someone harm him? Why did that woman callously throw him out of her car? Why does his potential end have to be in a shelter, unwanted and unloved? In the end, I don’t know if I’ll ever find the answer. But what I do know is I’m going to help give Romeo a chance at a better life with these photos and this blog post. I’m going to do my very best to let his sweet soul know what love and kindness is instead of pain and abuse. I don’t want my last memory of Romeo to be sad and alone in his shelter kennel, waiting for his fate to play out. I want a different ending to the play. Romeo (A#059010) is available for adoption on Monday, September 30 at the City of Tulsa Animal Welfare, located at 3031 N. Erie Ave. in Tulsa, OK., or call (918) 596-8011 for more information. Please open your heart and help Romeo find his happy ending. UPDATE 9/30/2013: Romeo is safe! He was pulled by Mutty Paws OK, a rescue in Oklahoma. Happy dance! 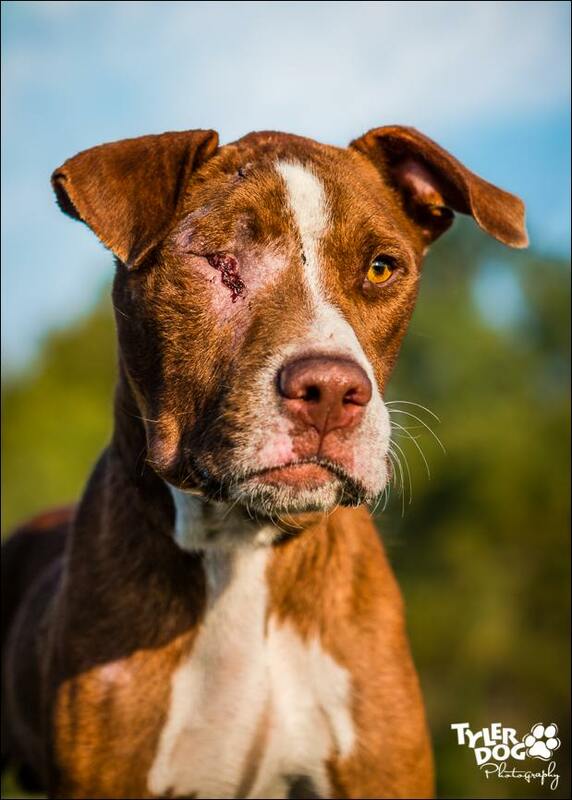 UPDATE 10/10/2013: We’ve been informed the rescue that pulled Romeo (Mutty Paws OK) is going on hiatus and needs to find homes for all their rescues, including Romeo. Please someone open their hearts and give this boy a forever home. He doesn’t deserve to be shuffled around. UPDATE 01/2014: We’ve been informed Romeo died in a horrific manner in the care of the rescue that originally pulled him and we simply have no words; we’re devastated. We’re sorry we failed you, Romeo. Run free, sweet boy.